Fragranced products are all around us: perfume, deodorant, air freshener, hair spray, candles, household cleaners, laundry detergent and disinfectants. Most of us are exposed to these products every day, either because we use them or are around other people who do. Unfortunately, the synthetic chemicals used in these products make a lot of people sick. A study was conducted in Australia at the University of Melbourne. Researchers found that one in three Australians experience adverse health effects from fragranced products. These problems include breathing difficulties, migraines, skin irritation and asthma attacks. The lead author of the study was Professor Anne Steinemann, who is a world expert on environmental pollution, air quality, and adverse health effects. She said "I'm investigating this fragrance problem in Australia and around the world and what I'm finding is that it's an epidemic and that there aren't that many differences among countries”. The study involved a survey of 1098 Australians. Results showed that 7.7 percent of respondents lost work days or actually lost a job in the past year because of the harmful effects of fragranced products in the workplace. Interestingly, one in six people said they would enter a business and leave as quickly as possible if they smelt an air freshener or strongly fragranced product. Professor Steinemann made a good point when she said "There's a belief that fragrance products in some way improve air quality but the opposite is actually true: fragrance products impair rather than improve indoor air quality and they pose a range of health and economic risks”. A lot of my patients tell me they feel sick when they can smell strong fragrances. They aren’t healthy for any of us, but are particularly harmful for individuals with impaired liver detoxification. If you inhale a fragrance, it gets inside your body. Your liver is supposed to detoxify your bloodstream of all pollutants you are exposed to. People with impaired phase 2 liver detoxification are much more likely to experience adverse health effects from synthetic fragrances. Impaired detoxification also places a strain on your immune system and can result in low energy levels. People with chronic fatigue syndrome have significantly impaired detox abilities, and this raises inflammation in their body. 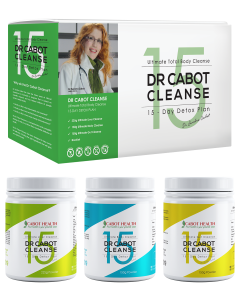 The 15 Day Cleanse has been specifically designed to improve liver detoxification, heal the gut and make the body more alkaline. It is a comprehensive formulation, combining potent antioxidants, high quality superfoods, herbs, greens, vitamins and minerals and is very high in protein. The formulation contains over 40 key ingredients to support liver and immune health and increase energy.